Most studies of the structure and function of Dipteran salivary gland polytene chromosomes are based on the phenomenon of the relative constancy of the banding pattern characteristic of each species. This made possible the building of cytological maps of polytene chromosomes widely used in genetic and molecular genetic research. The most detailed maps of the salivary gland polytene chromosomes of Drosophila melanogaster were those made in the 1930s to 1940s by Bridges and Bridges using the light microscope (LM) (see ref. 1). 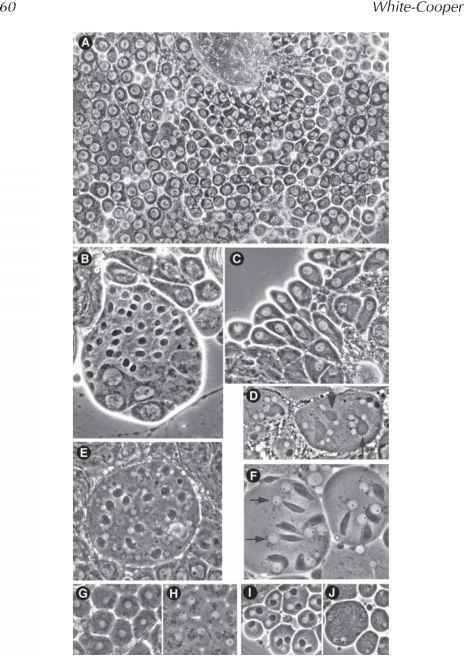 More recently, Sorsa and his colleagues (2-4) presented revised electron microscope (EM) maps covering the entire salivary gland chromosome set of D. melanogaster. To carry out this extremely laborious work, they used a squash/thin-sectioning EM technique. We consider this approach to be the best for precise mapping of politene chromosome regions. Moreover, chromosomes prepared by this method can be used for autoradiographic study, in situ hybridization and protein localization at the EM level, as described in this chapter.